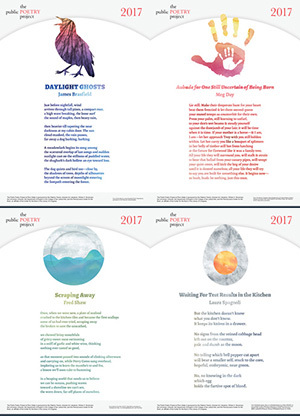 2017 Poetry Posters designed by Nathan Valchar. 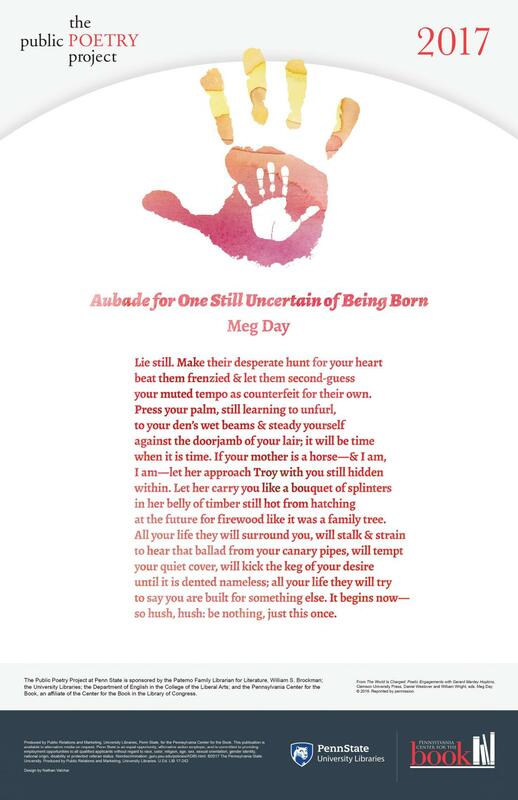 Meg Day's "Aubade for One Still Uncertain of Being Born" is a gorgeous love letter to possibility, to beginnings, and to the calm before the storm that is life itself. It brings us closer to that fragile yet resilient link between mother and unborn child, when they each belong to no one but each other. Meg Day’s sun-hot cadence-crafted image-rich Aubade is, at once, a warning and an homage to the unborn, as well as an elegy for all of those who have been mistreated or marginalized by the world. By describing the womb as both a lair and a Trojan horse, we come to understand that the world one is born into is a world full of various expectations and entrapments. But Day doesn’t present us solely with a world that will “stalk & strain . . . tempt . . . [and] kick the keg of [one’s] desire,” but lets the not-yet-born know that if and when they enter this world they have their own power, the power of unfurling, of steadying, of fire, and of song. While the poem warns that others will “try to say you are built for something else,” the poet reminds us that we are capable of protecting and caring for each other and a future better world. 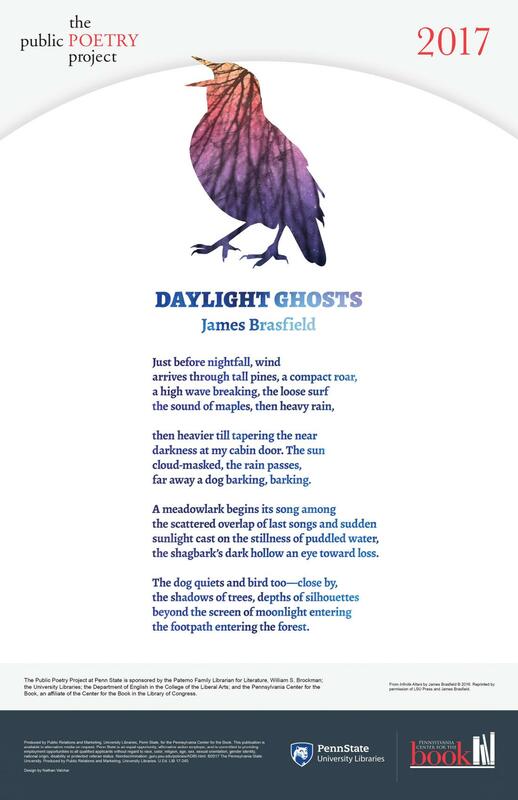 "Daylight Ghosts" richly evokes the otherworldly in its intricate observations: a dog and bird in the distance, and "the shagbark's dark hollow an eye toward loss," all build a rich setting for James Brasfield's incantation to the spirits who visit with us each day. In James Brasfield’s “Daylight Ghosts,” all the forces of the natural world arrive at once, fill and electrify the space around the solitary speaker’s cabin, and we come to understand, as the speaker himself does, that the animal songs of the cosmos are both ours and not ours, that they are full of beauty and loss and a mystery that will not be solved by our minds. And as such, this mysterious world—this shadowy forested haunted landscape—in which we find ourselves, deserves our attention and reverence, which Brasfield has so stunningly offered us here. This is a world I want to listen to and touch, to open the door of the cabin and return to. 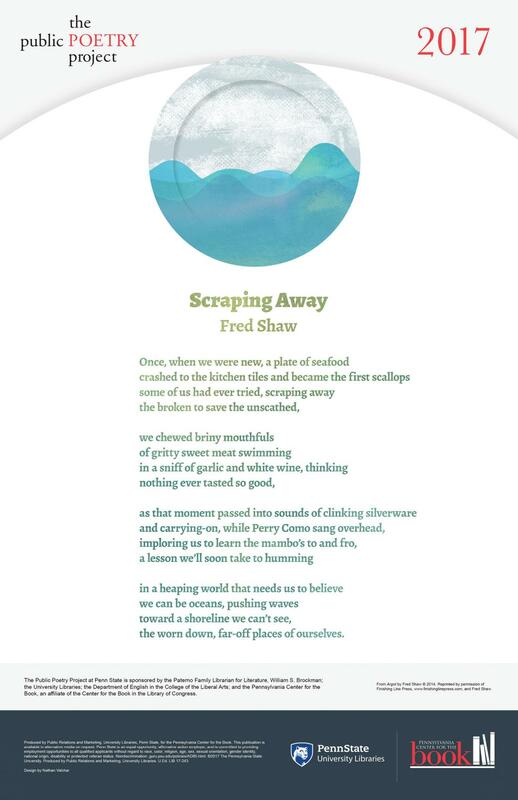 Fred Shaw's poem "Scraping Away" is beautiful and alive in its swerve from the micro to the macro—the detailed descriptions of a new food being tasted for the first time, and the heady realization that there is always more to learn and to absorb in this vast world. In its seemingly off-hand recounting of an incident at work, this is a poem concerned with class and labor, profit and loss, the behind-the-scenes reality which privilege ignores and upon which it depends. The poet of “Scraping Away” works the way Giacometti did, getting to the essence of an experience by working through what surrounds it, shucking the this-and-that to get to the “unscathed” gist, and revealing in the process “the far-off places of ourselves” which, paradoxically, are close at hand. In a time when the rich get richer and the poor get poorer, Fred Shaw’s poem reminds us that despite living in a “heaping world that needs us to believe/ we can be oceans,” the true richness of life only comes in “briny mouthfuls” and songs as big as Perry Como’s and as small as "clinking silverware." The people in this poem scrape away "the broken" to salvage the “sweet meat,” and find that “nothing ever tasted so good.” There is an evocative tension between the relishing of youth and new experience and a world that pushes us toward “the worn down, far-off places of ourselves.” But the real and simple things of the world—garlic and wine and moving to-and-fro—become, in Shaw’s vision, holy against potential scarcity and worldly pressures. Also appeared in The Best of Philadelphia Stories, 10th Anniversary Edition, published by PS Books, a division of Philadelphia Stories, Inc. In relatively few words, "Waiting for Test Results in the Kitchen" imbues an otherwise mundane moment with uneasiness, playfulness, and tenderness. 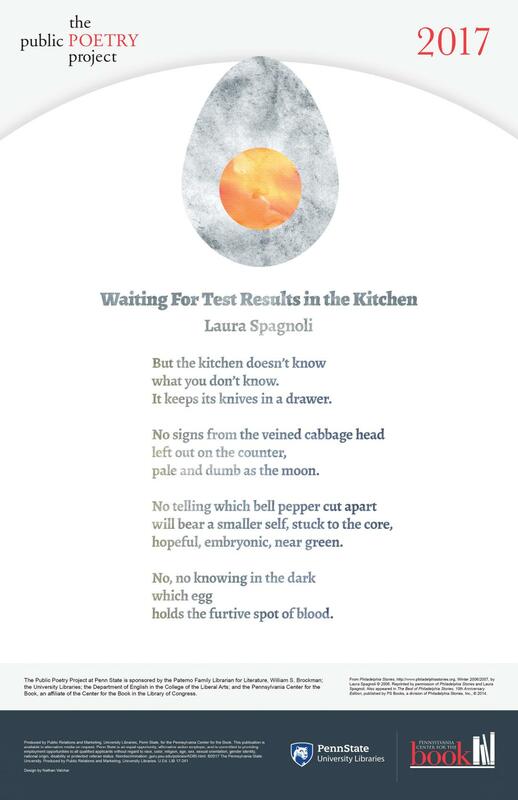 The result is a shivery, exceptional poem that demonstrates Laura Spagnoli's ability to delight and to devastate with the deft precision of her verse. By describing in beautiful searing detail the anatomy of a kitchen and the suddenly less ordinary preparation of a meal, Spagnoli reveals to us the intensity of waiting to know if one is pregnant…and, the fortuity of understanding—under the sway of those anticipatory emotions—the pregnant possibility of every moment and every thing…and how nimble and perpetual life is, and yet how we—small humans—do not get to know how or when it will enter. The speaker is acutely aware that nothing inanimate—the knives in a drawer, the dumb moon—will spill the secret. In the space between longing and loss that will come from these test results, everything becomes filled with both more alive and more ominous, the cabbage both veined and left out on the counter, pale and dumb, for example. Spangle’s poem manages to be both haunting and hopeful in remarkable ways.